I love rhubarb, especially in the spring. Put it atop a creamy cheesecake with a nutty crust — mmmm. 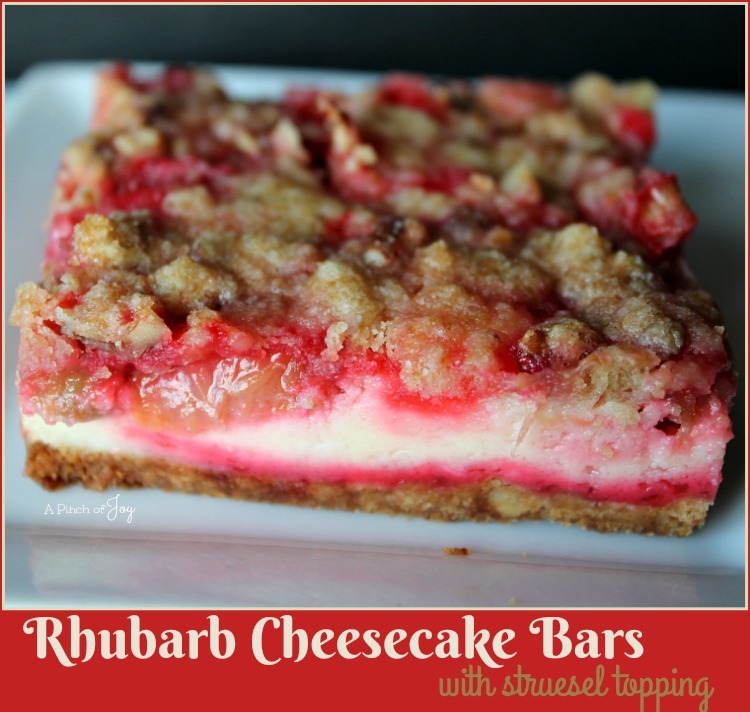 Rhubarb Cheesecake Bars – heavenly. So good you won’t want to stop eating until it’s all gone. One pound of rhubarb makes 3 cups of sliced rhubarb. The redder the color of the rhubarb, the sweeter the taste. So I hear. To me, it’s all relative and all tart! In fact rhubarb is one of the few tart things I do like. By the way, it is not a fruit. It’s considered a vegetable and is also sometimes classified as an herb. And the big green leafy top is poisonous so be sure to trim and discard it if you are harvesting directly from the garden. Place stems in plastic bag and store in the refrigerator until ready to use. Rhubarb will keep 2-3 weeks in the refrigerator. To prepare, wash each stem thoroughly one at a time. Trim off any blemishes and cut stems into uniform slices ½ to 1 inches each. For this recipe, where it is not cooked ahead of time, go with the smaller slices. The sugar in the rhubarb layer is needed to draw the juices out of the rhubarb, as well as to counteract the rhubarb tang. Strawberry gelatin adds to the flavor in a subtle way, however, I always use sugar free gelatin to lessen the carb count. If that doesn’t matter to you, use regular gelatin. The creamy cheesecake is the perfect base for the pretty pink of the rhubarb. Looks sooo nice and tastes wonderful! And if you want to count it as a vegetable for the day – no judgement here. Although a New York Court judged rhubarb a fruit in 1947 because it is most used in desserts! 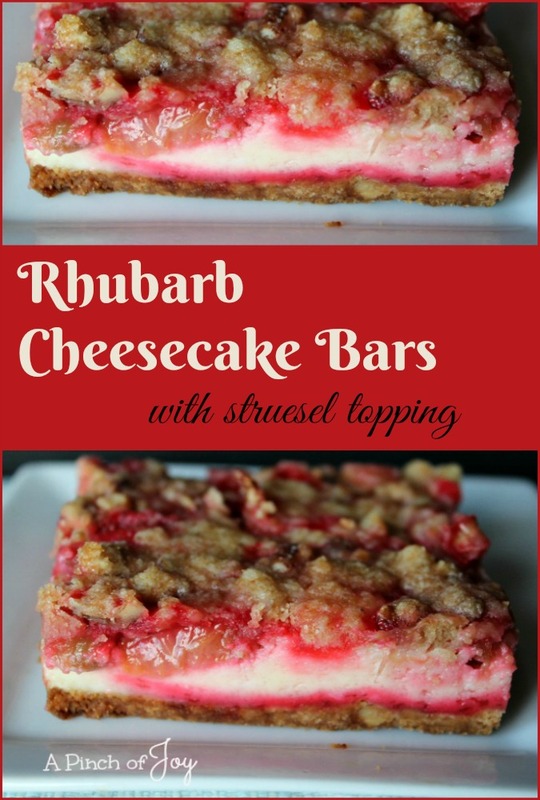 Rhubarb Cheesecake Bars – heavenly. So good you won’t want to stop eating until it’s all gone. Preheat oven to 350 degrees. Prepare 9x13 pan by spraying with cooking spray. In mixer bowl, mix all crust/topping ingredients, except pecans. Coarsely chop pecans and add to mixture. Continue mixing until butter is fully incorporated and the texture starts to become pebbly. Set aside one cup of flour mixture for topping. Press the remaining mixture into the bottom of the prepared 9x13 pan. Place in preheated oven for 8-10 minutes. Remove and set aside to cool slightly when done. Meantime, place softened cream cheese in mixer bowl and beat until light and fluffy. Add sugar, eggs and vanilla and mix thoroughly. Pour cheesecake layer over the crust and spread to cover evenly. Spoon rhubarb gently and evenly over the cheesecake layer. There may be liquid in the bowl, as the sugar tends to draw out the juices. Drizzle juice over the rhubarb layer. Sprinkle reserved crust mixture evenly across the rhubarb layer to make topping. Bake at 350 for 40-45 minutes. Edges should be brown and bubbling but center will not be firm. Slight jiggle in the middle is desirable. Cool for an hour or more, before placing in the refrigerator. Let chill 3 hours or overnight before slicing and serving cold. Sugar is listed as an ingredient in the cream cheese layer but in the directions does not say to add the sugar to the cream cheese. I did. Great dessert. . .love it. Bringing it to Father’s Day tomorrow.